The main regulatory body of GAZBIR is the General Assembly, and the Regulation dictates that only merited Members can join the Assembly. Ordinarily, the General Assembly meets in the month of May every 3 years, and elects 11 permanent and 11 associate Members for the Executive Board, as well as a Chairman, amongst its members. Furthermore, the Assembly holds the right to provide general instructions to the Executive Board, and to give authorisation for any facilities or actions to be constructed in order to ensure GAZBIR can achieve its targets and goals. The Executive Board manages GAZBIR in accordance with the goals and targets set out in the GAZBIR Regulations, and represents the interests of GAZBIR in all matters. The Executive Board is made up of 11 people, namely the Chairman, Vice Chairmen, General Secretary, Treasurer, and other members. 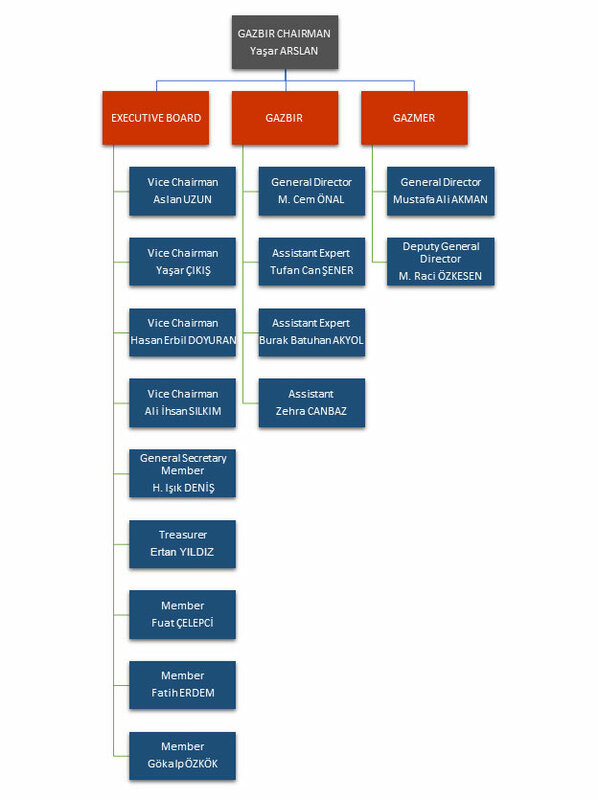 Association Directorate is responsible of representing GAZBIR, and managing every-day matters. It coordinates working group activities and other events on behalf of GAZBIR.